We all ?know? that Marco Polo went to China, served Ghengis Khan for many years, and returned to Italy with the recipes for pasta and ice cream. 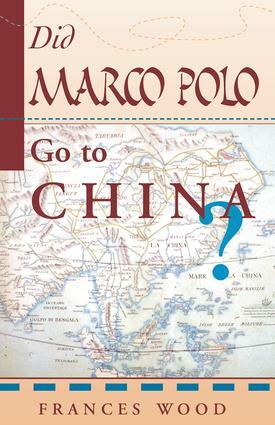 But Frances Wood, head of the Chinese Department at the British Library, argues that Marco Polo not only never went to China, he probably never even made it past the Black Sea, where his family conducted business as merchants.Marco Polo's travels from Venice to the exotic and distant East, and his epic book describing his extraordinary adventures, A Description of the World, ranks among the most famous and influential books ever published. In this fascinating piece of historical detection, marking the 700th anniversary of Polo's journey, Frances Wood questions whether Marco Polo ever reached the country he so vividly described. Why, in his romantic and seemingly detailed account, is there no mention of such fundamentals of Chinese life as tea, foot-binding, or even the Great Wall? Did he really bring back pasta and ice cream to Italy? And why, given China's extensive and even obsessive record-keeping, is there no mention of Marco Polo anywhere in the archives?Sure to spark controversy, Did Marco Polo Go to China? tries to solve these and other inconsistencies by carefully examining the Polo family history, Marco Polo's activities as a merchant, the preparation of his book, and the imperial Chinese records. The result is a lucid and readable look at medieval European and Chinese history, and the characters and events that shaped this extraordinary and enduring myth. Frances Wood is head of the Chinese Department at the British Library and author of A Companion to China and The Blue Guide to China, among many other scholarly works.